A long opener, playing slightly uphill. Dog leg left the tee shot is well guarded with 3 bunkers. The lay up again well protected with bunkers on left & right. The Green slopes back to front and is wise to leave the ball below the hole. Bunkers guard the left & right side of the green catching any misjudgement in the approach shot. The tee shot plays slightly downhill & Bunker guards the right side of the fairway. The second shot plays uphill into a narrow green, water is tight to the left pushing players to hit to the right side. Missing the Green on the right leaves a tricky chip & the water awaits anything that hit to strongly. The tee shot is visually demanding with OB left and 2 lakes on the right, but the fairway is generous. Second shot plays slightly to the left, hitting towards the bunkers make sure the layup is short of them. Your approach shot is into a generous green, the sensible shot is to hit to the middle of the green as bunker awaits long if to aggressive. Depending on the wind driver isn’t always the wise option. Bunkers on both sides and the fairway narrows the closer you get to the green. The green is tricky with a ridge running from back to front, hitting the correct portion of the green is key to leave a easier putt. The first of the par 3’s and the most demanding. The hole can range from a mid iron to a 3 wood depending on the wind & tee of the day. Water on the right, so safe play is to play to the left side of the green and it will kick right. 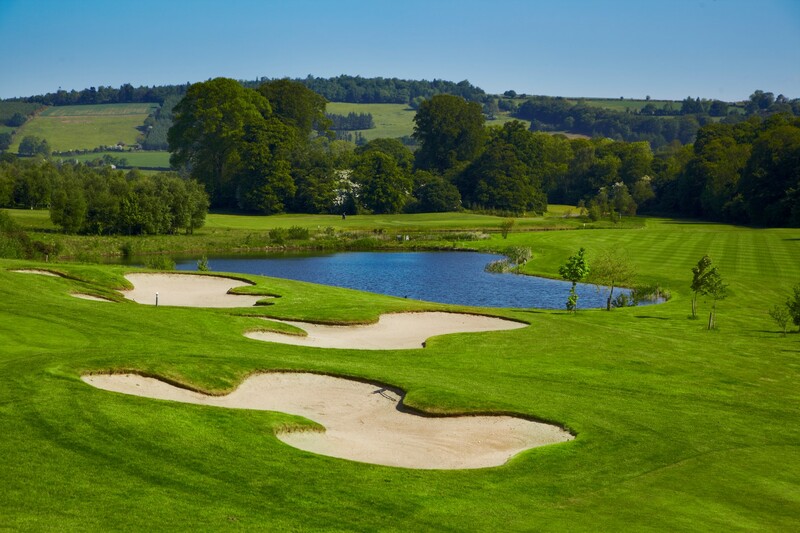 The tee shot runs along the River Slaney. Not a driver hole for everybody and a draw shape would be ideal. Good Tee shot will leave you a mid to short iron in, distance control very important as green is tricky. Green angled left to right and slightly raised club selection is paramount to hit this difficult green. Hitting through a narrow gap for your tee shot this green is on for your mid to long hitters. If laying up you have a choice whether to go to the right or left of the bunker as the fairway splits. Green is generous in size so be aggressive with your approach shot and get your reward. Tee shot should be hit up the right half of the fairway, staying away from the bunkers on the right and leaving a better angle into the green. Second shot plays slightly uphill and hitting the right level on the green key to leaving a easier putt. Straight away hole Two bunkers on the left and tall pines on the right protecting the fairway but the fairway is generous and this hole is a good birdie opportunity. Long par 4, Tee shot should hug the bunker on the left as the contours will kick it toward the centre of the fairway. Large Bunker complex protects the green on the right, so favour the left side of the green. Tee shot plays slightly uphill and is guarded with three bunker on the left, the bunkers is a good line of the tee as it will kick to the right and leave a great angle playing up the full length of the green. You only need to know one thing on the approach shot Hit one more! Don’t let the beauty of this hole fool you, green it a must hit. Very tough up and down anywhere around this green. The signature Hole on the course. Fairway is generous in size But the Big old Tree sit proudly in the middle of it. Tee shot should favour the left as the contours will kick it to the right. Anywhere on this green is considered a great shot. The Brave will hit a long draw through the narrow gap, don’t over do it as the River Slaney awaits to collect your ball. Second shot is long, aim for the right side of the green as it will keep you away from the trouble on the left. This is the shortest of all the par but plays very tricky. River left, forest right and a small stream protecting the front of the green club selection is key. A make or break par 5. A right of centre tee shot will kick the ball to the left, setting up a second shot guarded by water and sand and watched by a packed clubhouse. Don’t be intimidated, as the bail out to the right will leave difficult up and down. For the golfer that doesn’t go for it a generous layup area awaits leaving a short iron the green.